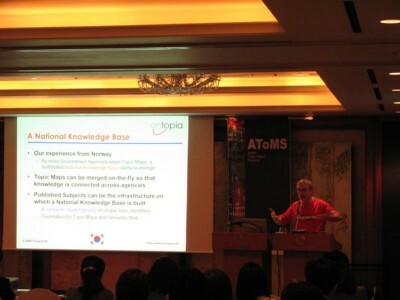 The last day of the week in Seoul was given over to AToMS, Asian Topic Maps Summit, a one-day conference devoted to Topic Maps. 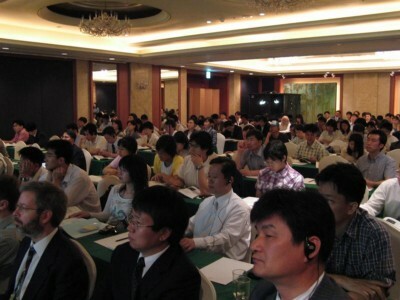 The conference was organized by the two Korean standards agencies (KATS and KSA), and attracted more than 200 attendees. I arrived a little late (in order to get some sleep), and by then it was hard to get a seat. One interesting feature of this conference was that there was simultaneous translation throughout. Two people sat in a black glass box at the back (just visible in photo above), taking turns to translate. Delegates could get a little black box with an earphone attached, which received two radio channels, one with the speaker's voice, and another with the translation. Talks in Korean were translated to English, while talks in English were translated to Korean. I only heard the translation of one of the talks, and it seemed very good to me, although I wondered if some things might not have been left out. There was also a slight time lag, inevitably, so what the English voice was talking about might not be the same as what the speaker was pointing to at that moment. Still, it did seem to work quite well. The first speaker was Sam Oh, who did the introduction to Topic Maps. I only arrived at the end of this, and the printed slides are in Korean, so I can't say much about it. The second keynote speaker was Sung Hyon Myaeng, also wearing the same red t-shirt, who spoke on techniques for natural language processing, and their application to Topic Maps. I was busy polishing my own slides through most of his presentation, but listened in to the simultaneous translation from Korean. There were two exhibitors at AToMS, both quite interesting. One was INEK, our Korean partner, which has done a lot to promote Topic Maps in Korea, and a sponsor of the conference. 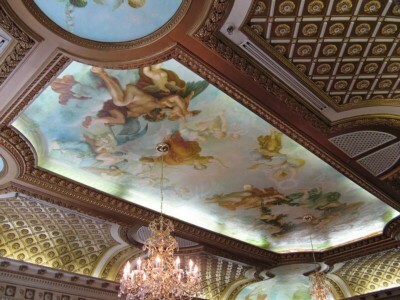 INEK specializes in library systems, and has the majority of the Korean market. They were showing Korean topic maps in Omnigator and Ontopoly, and presented SKIM, their Topic Maps-based information management application. They also had a presentation on SKIM in the post-lunch session. The other exhibitor was Frotoma, a new Korean Topic Maps software vendor with venture capital backing. The name is short for "Frontier of Topic Maps", but whether they are at this frontier or not I never found out, unfortunately, for reasons soon to be explained. The food was of course also great, and the lunch consisted of no less than seven dishes, plus fruit to round it all off. I, once again, ate more than was good for me, and thoroughly enjoyed myself. The first speaker after lunch (never an easy position on the program) was Robert Barta, describing his experiences with developing open source Topic Maps software, and using it at Bond University. I was not able to give this presentation the attention it deserved, as eventually the excessive lunches (and dinners) caught up with me, and my stomach rebelled. I won't go into detail, but I definitely did not feel well. As a result, I only caught bits of what Graham Moore had to say about the Norwegian Postal Service, which is using NetworkedPlanet's software to create a new intranet. The case study sounded quite interesting, but my thoughts were, frankly, elsewhere. He was followed by Eunwhan Jung of Frotoma, but by then I, too, was elsewhere, unfortunately. After this it was my turn to speak, which I did. I thought it went reasonably well. Naito-san afterwards told me I seemed "not cheerful", but then I definitely was not. There were three more speakers after me, but I spent the rest of the day in bed, unfortunately. Then followed a day with some sightseeing, and then the long flight home. Lars! You made your Trip to Han-River. I was worry about your health, but you regained your health. That's Good! 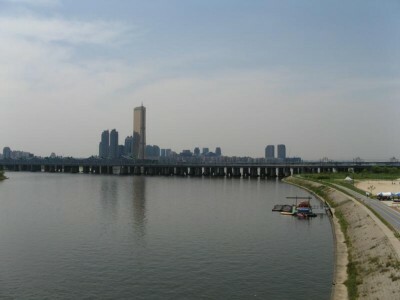 After you left to your home, Seoul has been had really fine day still, I mean, without any fog and clouds. If you were be here in this week, it'll be beeter, I think. ^0^ Enjoy your time~~~ Lars.